Pour les renseignements en français, cliquez ICI. I consider myself to be humbled, blessed and deeply honoured to facilitate deep transformations in those I work with. Together, we unfold through the art of presence, active listening, space holding, sound journeys, spiritual teachings and ancestral wisdom to unblock and release pain in the emotional and physical bodies. As a team, we, the receiver, space holder-transmitter and the sacred sounds journey to the other side of our conscious awareness, where we unlock and discover the potential that has yet to be accessed and seen. You and I become like the serpents dancing, moving with and through energies that may feel heavy and dense until we get to the sense of innocence, lightness and fully embodied joy that is the essence of your being. From there we amplify the shifts and transformations by introducing sound. Each session is divinely guided and channelled to best assist you on the integration of your truths, the pursuits of your passions and entering into dialogue with your higher self. Leaving the physical body, and being projected with and through sound into the higher dimensions and beginning the ascension of the soul, we explore a soundscape that brings clarity, inner peace and acceptance of all that is. As I Sarah, surrender into the sounds, so do you and the results are breathtaking beautiful. In the presence of the feminine and the archetypal energies at play, ancient healing practices and wisdom in a sacred temple space allows deep healing and releases to happen. This activates the radiance within, the light that shines so bright, and take flight through the power of prayer and grace channelled through sound. Enter the castle of your soul, and remember the power that dwells within. I can open the door and welcome you, but you must step through into the realm of healing and embodied living. Are you RWA -Ready, Willing and Able to feel your own magic? Sarah Turner is a McGill University Graduate of Anthropology and International Development, which lead her to travel and live abroad in over 30 countries, learning from each culture and tradition she immersed herself in. She feels at home and connected to Bali, Indonesia, the place that birthed her healing journey. She is also deeply in touch with the heart beat of Pachamama, the mother earth energy in Latin America, where she travelled, fell in love with an Ecuadorian and lived for two years. Her passion for travel, and learning and interacting with all cultures, and people keep her following where the wind blows her. She is happy to facilitate sessions and trainings in English, French and Spanish. By practice and virtue of dedicating the last five years solely to sound and holistic resonance, she works as a fully independent and full time sound healing practitioner and sound healing instructor. 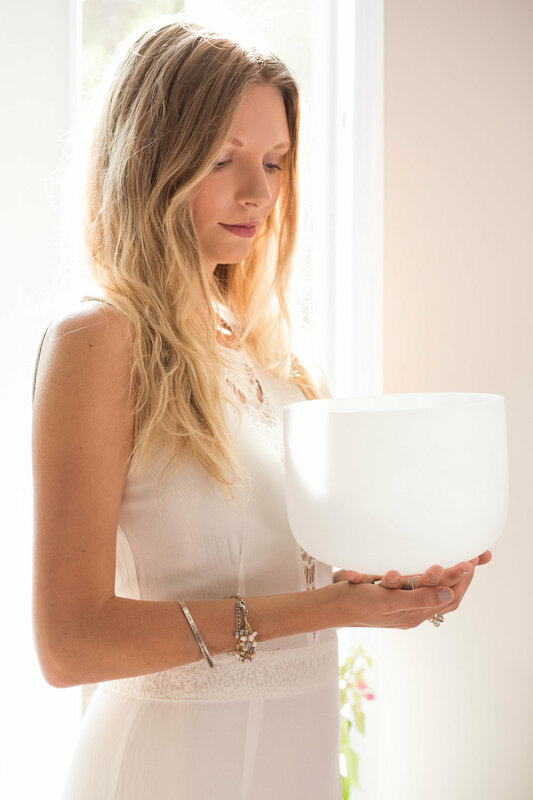 She has now conducted over 2500+ private sessions, 400 + group sound bath, and has trained over 50 students totaling well over 700 hours of one on one private training with her students. Suffice it to say that Sarah has become fully engulfed by her passion to work with and through sound as her contribution to raising the collective vibration. An eternal student, she is constantly improving on herself, deepening her understanding and seeking the right teachers and mentors to guide and assist her on staying on her highest path potential. She travels far and wide to learn from those she feels deeply called to and those who are well established and admired in the field of sound healing. She has trained and been certified and trained as a Spiritual Healer, Reiki Practitioner and Certified Yoni Steam Practitioner, she is trained in Yoga Nidra, Biofield Tuning, Theta Healing (Basic DNA, Advanced DNA, Dig Deeper), Sound Healing courses with numerous teachers . She has also taken courses in Ayurveda and in the practice of Tantra and Sacred Union. She is currently undertaking her studies of the Archetypes under the teachings of Carolyn Myss, who she admires and respects immensely as well as taking the courses of Alexandre Nadeau for continued growth and expansion. Sarah offers group and private sound sessions, cacao ceremonies, red tent circles, new and full moon ceremonies and workshops in sound healing from The Resonance Temple in Montreal (Lachine), Quebec. She offers retreats and sound healing training and workshops both locally and internationally . Sarah is most called to work on this struggling with issues surrounding infertility, hormonal imbalance, grief, depression, emotional traumas, feminine empowerment and manifesting love and abundance. She was able to physically heal herself with sound and her dedication to inner work and a devotion to the self, she enjoys helping those who are trying to tackle illness through alternative methods of healing and deep inner work. Sarah now only works with individuals who feel called both to sound and to her as a practitioner and who are ready to fully engage on their healing path. Due to the high volume of demand, she is practicing the art of discernment with both sessions and teachings as they require her to show up fully. Sarah requires that you be fully ready to meet her to ensure an equal energy exchange. If she doesn't feel she can be of assistance or is not the right energetic fit she can recommend one of her many students who can best meet your needs. Workshops given in groups and/or privately from introductory self healing to advanced practitioner training. From 1 Hour instruction to 25 hour courses designed to meet your needs and around your schedule. Option to practice as an apprentice in a mentorship program. Be guided and assisted - Find the perfect Sacred sound instruments and healing tools to meet your needs and budget. Amplify your self care or healing practice with the addition of Tibetan bowls, tingshas, mallets, bells, crystals, incense, mala beads, yoni steams and essential oils are available for purchase at the temple and at events across the country.